"Gosh" you might say, "that's one weird looking jellyfish". Well, you'd be partly right. Certainly it looks rather odd but it isn't a jellyfish, it isn't even one animal. 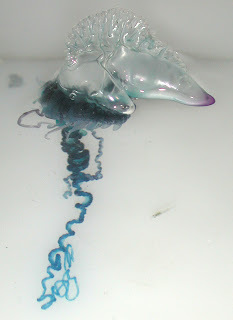 The Portuguese Man o' War is in fact a whole colony of four different kinds of organism, each adapted to perform a specific function for the benefit of the whole. They are all either a kind of polyp, which are like really small sea anemones, or medusae, similar to tiny jellyfish, but here they are all connected to each other and are unable to survive on their own. Such is the way of the siphonophores, an order of colonial creatures related to... can you believe it? Sea anemones and jellyfish. In case you were wondering, the whole thing develops from one egg that sprouts all the other parts, rather than loads of little polyps undertaking an epic journey of self discovery in search of their People. 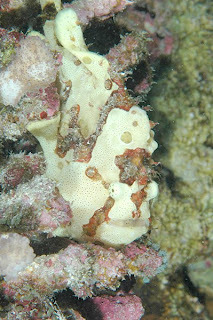 The frogfish is a darling of a monstrosity. Plump and round, rather eccentric, available in an incredible variety of colours and patterns, they are, in all honesty, quite cute. Cute in a monstrous way of course! There are some 45 species of frogfish found in tropical and subtropical waters all over the world and ranging from just an inch long to 38 centimetres. They mostly keep to shallow waters, around 100 meters or so, keeping to the ocean floor where their extraordinary colours camouflage them against corals. Others are camouflaged against rocks and plants. 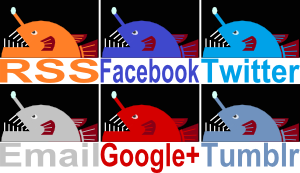 One, the sargassumfish, lives among clumps of drifting sargassum, a kind of seaweed. Another mimics a sea urchin of all things, some even have algae growing on them. They can be so well camouflaged that sea slugs might crawl all over them without even realising! There's a bit of a theme developing here: yes, most frogfish don't like to move too much. If you're willing to have a slug crawl all over you then you clearly aren't strongly wedded to the notion of motion in the ocean. (Erk. That sentence made me think of a song by Enya and so I listened to it and now I feel a bit melancholic. Anyway, tally ho.) Such stillness can be an important part of anyone's day, but it doesn't get you fed. So how does the frogfish get itself fed? When it comes to the biggest flower in the world, there isn't quite so clear cut an answer as you might imagine. Technically speaking it's simple, but when it comes to the impression one gets and sheer awe, not so much. There are three contenders, but one of them is on a boring palm tree and looks impressive, but not much more. Let's confine ourselves to the other two. With its grasping pincers and narrow tail tapering to a bulbous sting held aloft, the scorpion is certainly one of the more memorable and even charismatic of the arthropods. Interestingly though, its most defining features aren't entirely unique.